I saw some reccurente questions on this board about 446MHz in France. 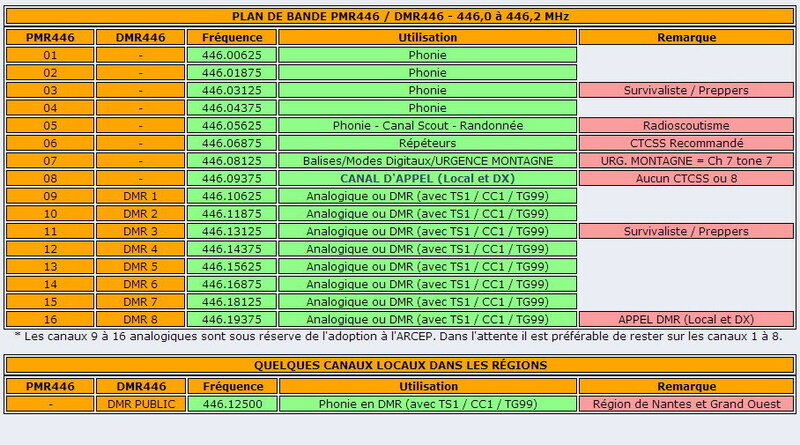 Here, you can see all the channels available for free communication in France. In PMR446 and in DMR446. Yes, the same as the whole of Europe that recognises CEPT. And throw in dPMR too. Nice that survivalists/peppers have their own channels. Lets just hope their Binatones survive the EMP. When was analogue voice on the Digital PMR446 channels legalised? the EU makes the recommendations , the national government chooses how they should be enforced. What will happen to 446 post Brexit interests me! Will we lose it all together ? immediately, all EU laws will be enshrined in UK law, then we can change/amend them after the fact, as we see fit, or (more likely) as we justify the need on spending resource looking at/changing them. 446 will remain as-is for the UK for the foreseeable future. I can't see anyone bothering to lobby for a change really. It will be the same as it was prior to going in - and the same that the countries like Norway, Iceland, Liechtenstein and Switzerland did - they adopted the same spec, even though they're not in the EU. The UK specs still exist, but were 'under' the EU wide spec - we'll simply carry on - no change.